The Pininfarina legacy continues with a radical new car just released by the famous Italian design studio. The “B0” as it is called (that’s “B Zero”, by the way) is a four-seat hatch that is small, affordable and all-electric, the product of a joint venture with French battery specialist Bollore. Since it is an all-electric plug-in, the B0 produces no carbon dioxide or particulate emissions. 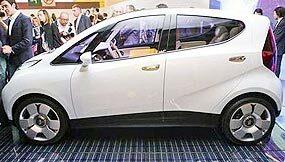 Pininfarina also has used body, trim and battery materials selected to minimize the total environmental impact. All are reusable and recyclable, while solar panels and regenerative braking help make the most use of each charge, helping minimize the drain on the electricity grid. The electric motor develops 45 kW and is mated to an automatic gearbox. Power comes from the Bollore-developed lithium polymer pack, a sophisticated mix of batteries and supercapacitors - the latter providing a substantial boost to the efficiency of the regenerative braking system. The company claims it is maintenance-free, with a battery life expectancy of about 200,000 km. It is no fireball performer with a zero to 60 kph time of 6.3 seconds, but amongst the small petrol-engined eco-cars is reasonable. Top speed is reported as an electronically governed 130 km/h, and with a claimed range of up to 250 km. This would certainly make the B0 a good city/commuter vehicle, but viability will depend upon price in the marketplace. But just remember that it is B Zero, not B Oh! Last week I asked why the Daimler Conquest was called the “Conquest”, and mentioned the warning that the purchase price was five shillings and ten pence over 1,511 pounds. Of course, that was to throw you off the scent. It got its name from the fact that the list price ex-works was 1066 pounds, Norman Conquest and all that. The difference between 1,066 and 1,511 was sales tax, stamp duty and tea money! So to this week. An easy one. Which pre-1970 Bugatti models came in left hand drive? Toyota stamps out snake bite! In its never ending plan of making life better for Toyota drivers, Toyota Thailand has come up with a novel sales gimmick for its 2009 line-up. With so many venomous snakes in Thailand, some of which are amongst the most deadly in the world, the new Toyota models feature a “Viper Control System”, according to the official Toyota Thailand website. You should be covered for the common Malaysian Pit Viper and Russel’s Viper, but I am not sure if the Toyota Viper Control System will extend to the Thai Cobra. This Viper Control System comes as “timer integrated” or “manual with three step adjustable”, but how this is applied to the venomous snakes is not described in the website. Presumably, this is a dealer responsibility to make sure all new Toyota drivers are conversant with the Viper Control System. I was always taught that physics was an exact science. What goes up must come down, for every action there is an equal and opposite reaction, similar magnetic poles repel, pressure is equally distributed in a closed vessel, the speed of light is absolute, e+mc2 and all that kind of stuff. Well, it’s not. If you ever want to disprove physics as a science, then buy a race car. They do not obey physical laws. Give us a push, lads! You want an example? My perfectly good race car had performed perfectly all day. For the last event, I drove it down to the marshalling area to wait before going out for my race. I was about 10 minutes early, so I turned the engine off and waited for the signal to start the engine and move out onto the race track. The ‘start engines’ board was displayed, I turned on the ignition and hit the switch, and not a cheep out of the engine. The starter motor was working, the engine was turning over, but it did not look or sound anywhere near firing. The pit crew rushed over, and they quickly checked under the bonnet. Everything was fine, all ignition wires were in place, but no spark to the plugs. Now this was the same engine that had driven me from my pit to the marshalling area. This was ridiculous. 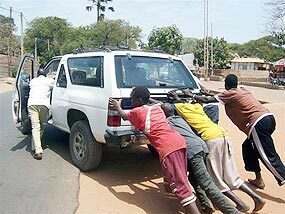 The crew got round behind and we attempted a push start. Still it wouldn’t fire. The race started without me. I swore a lot. We pushed it back to the pits and began to systematically replace every part of the ignition system. Eventually, with a new coil, it fired up, ready to go - but by then far too late. So how does a working coil just suddenly ‘not work’ any more? Especially after the ignition system had been turned off, so nothing was happening to the coil to make it malfunction. That’s some electrical law that I’ve never read about. Mind you, I have always considered car electrics to be a black art. Take the battery, for example, and I am sure you have all experienced the following. You have a perfectly good battery which is just over 12 months old. In your mind that’s almost brand new. In fact, you can even remember how much you paid for it, so it must be very new. And then one morning it won’t turn the engine over. It worked perfectly yesterday, and now it won’t, or doesn’t want to. You push start the car and run it for half an hour, as you suppose you must have left the headlights on, or something equally as explicable. Turn it off, and hey presto! It’s as dead as a dodo. If you are really into masochism, you then borrow your mate’s battery charger and leave it on all night. Triumphantly you remove the cables and jump in. It doesn’t work. Perfectly good one day, completely cactus the next. Explain that one, Mr. Einstein. My friends who know about these sorts of things tell me that batteries in Thailand last about 18 months to two years. Anything after that is a bonus. Well, it sure as hell ain’t Superman! This is the only Helicron in the world, built in France in 1932. In the late 1930s this one-of-a-kind Helicron was placed in a barn and forgotten. More than 60 years later this strange little piece of automobilia was rediscovered, rebuilt, and reintroduced to the world. Although the manufacturer and real history is unknown, it is believed that this car was built in France in 1932. Following WWI, many aircraft engineers were demobbed and they turned to the auto industry to try and use their knowledge, and oddities like the Helicron were the result. More than one propeller driven car has been made with results of 59 miles per hour having been achieved at Brooklands by one in 1912. As in this example, a few entrepreneurs developed propeller-powered cars with the notion that propeller power was an efficient means of moving a vehicle. 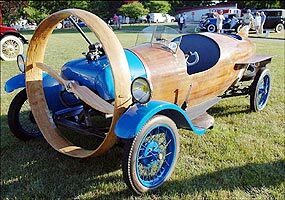 On this car, when the wooden propeller is spinning at full speed, the Helicron can hit freeway speeds exceeding 75 mph. As far as is known, this is the only Helicron in existence, and is owned by Lane Motor Museum in Nashville, Tennessee. Anyone want a second-hand Honda? The scuttlebutt in the EffWun circles is that there are 30 groups of people stampeding through the Honda F1 Racing garages, waving shedloads of money to buy the team that Honda pulled the plug on at the end of 2008. Quite frankly, I do not believe that there are 30 genuine purchasers out there. Remember that not only do they have to buy the complete team, buildings, spares etc, but they also have to fund the whole shooting match for the 2009 season. Even if they buy Honda Racing for a nominal $1, there’s a few million dollars needed to complete the season. However, the media circus states that Honda Racing CEO Nick Fry’s confidence is growing that the team will be on the grid for the start of the new Formula One season at the end of March. Since Honda sent shockwaves through the sport by pulling out of F1 five weeks ago due to the global economic crisis, Fry and team boss Ross Brawn have been involved in talks with a number of prospective new owners. Fry concedes to being initially sceptical that a resolution would be found, but as time has progressed, his optimism has increased. “Right at the start of this process (F1 supremo) Bernie Ecclestone said he was 100 percent confident we’d be on the grid in Melbourne,” said Fry to autosport.com. Fry confirmed he and Ross Brawn are now in talks with Honda in Japan about which of the offers would represent the best way forward for the company. “We had, as you might expect, a huge amount of interest at the start - probably well in excess of 30 groups came to us.” In the car sales lingo, the tyre kickers. “We have narrowed that down to something in the region of a dozen, and we’re currently talking to Honda about what is the best bet for the future,” says Fry. “Many of the potential owners have been kind enough to talk about this as a once-in-a-lifetime opportunity, to get something which does have the chance to do very well in the next couple of years,” remarked Fry.